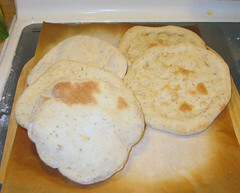 I tried to make flatbread to go with dinner, time constraints kinda blew that out of the water. So I made a sandwich with provolone, turkey, ham, lettuce, Caesar dressing and faconbits using two of them. The complete set would have been 8 flatbreads. I used 16 oz of high gluten flour just to experiment, only to discover that much gluten doesn't relax for the shaping like regular bread flour does. I also raised the pizza stone from the bottom to the middle of the oven, at 500 degrees it does brown the bread slightly faster but 550 makes it brown a minute or two quicker, so I"ll have to experiment with higher temps and stone positioning in the oven to find optimal placing for The Perfect Flatbread. Today around 4pm i got hold of queza7 and arrange an outing to the Mediterranean Market, which we'd missed on our last shopping excursion. She got something, I got some basmati rice restock, some tea biscuits for the kids to gnaw on, and some Assam tea which is pretty good for what I would call a standard tea (as opposed to a strongly flavored tea like jasmine or cardamom). I'm looking forward to seeing how it works with some variations, like the addition of orange peel or as iced tea. Kiyan lost his crocs while we walked from one store to another, I didn't notice at first. After driving back to retrieve them, I found both but one had been run over and ruined, possibly by me. The plastic pins holding in the strap across the back were broken. He kept losing them anyway, so Kiyan will remain Crocless for another year or so.